You are here: Virgin Islands News Online » News » Fmr 'Dancehall Queen' Lady Saw now working for God! Fmr 'Dancehall Queen' Lady Saw now working for God! It was just after midnight Sunday morning when Lady Saw, the dancehall icon who has converted to Christianity, got a message from God. 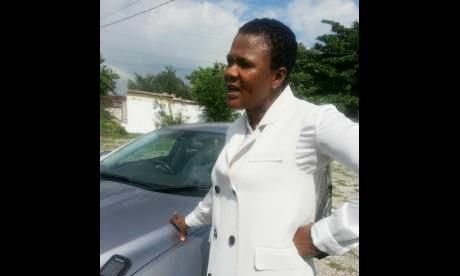 The 43-year-old artiste, whose name is Marion Hall, said the Lord gave her the name of a young woman who she claims works as a prostitute along Port Henderson Road, more popularly known as 'Back Road', in St Catherine, and directed her to go talk to her. Hall was sharing her experience at the Emmanuel Apostolic Church on Slipe Road in Kingston yesterday, where she attended her first Sunday service since she was baptised there last Monday. The former undisputed queen of the dancehall, whose sexually explicit lyrics and stagecraft defined her more-than-two-decade dancehall career, admitted she was nervous and hesitant about the trip, but decided to go after the Lord revealed the young woman's name to her. "I was lying in bed and the name just came to me ... and it wasn't one of those common names; it was something very unique," she recalled. To Hall, this was a sign that the Lord was using her. She said 10 minutes after she got to 'Back Road', she found the young woman through friends. "When I was asking for her, everyone was saying, 'Yeah, man, is the girl weh seh shi a go get baptise tomorrow'," Hall told The Gleaner after the service. She said amid the gaze and laughter from some onlookers, she embraced the young woman, prayed with her and delivered the message from God. She refused to divulge details of the message. "I remembered the whole story of Jesus and His messengers and [I know] people will laugh, but it didn't offend me or anything. In my mind, I jus feel like God will soon reveal why He sent me there," she said of the reaction to her trip. "For Him to use me like that after where I'm coming from and what I have done, it shows that no matter who you are and your past sins, God accepts you and that He has use for you," Hall added, while indicating that she has embraced her new mission of spreading God's word. Before she headed to church, Lady Saw revealed that she encountered a slight dilemma. "I couldn't find no clothes [to wear]. Everything [is] sleeveless or the skirt dem too long or too short. A have to go and get some different clothes," she said, laughing. Hall sat several rows from the front of the large church. She danced, sang, clapped, and even granted a few requests by taking cell phone pictures with other parishioners. "I am feeling so happy, and the message was great. I am more confident to speak about God and to accept Him and praise Him in a crowd," she insisted. "Normally, I would be shy and don't want to praise Him or be worried that I would get in the Spirit and drop a grung and embarrass maself. But it doesn't matter now; that's where my joy is right now," she continued. You have made the right decision girl with God all things are possible. At least he touched you but PM Portia Simpson is waiting patiently for that same touch so as to call the election next year at the right.He is a mighty and wonderful God I can testify to that and always there to forgive us when we trespasses and do wrong.Praise the Lord. Lady Saw: "You all most live right get away from the perversions of Dancehall"
Fan: " But Ms Saw isn't it the same dancehall music that you are now living off of that affords you the ability not to work, that got you the same Mercedes that you are now driving up to the Lords house with? Why are you still living the dirty rewards of sin?" Lady Saw: "Chah don't mind that"
u sound like a fool. your words are ordered by your master the devil. I'll give her six months!